Can you find the sleeping boy? My kids like to sleep like this too! Hmmm… that blanket has FEET! perfect blanket to snuggle. happy WW! He He!! I see the feet though. My son does this all the time too! I have to search to find my kids when they sleep too. Cute shot. I totally wish I would do that right now! LOL! How cute! All wrapped up! Makes me want a nap. I don't know how kids sleep they way they do. He is so silly. And great for WW. Some days it is just like that. If the covers are over the head nothing else matters. Great Photo! I always wonder how they could breathe under the blankets like that!! Happy WW! Such a cute picture! The feet tell all. warm and cozy sleepyhead. Awww like a bug in a rug…. How funny, I actually had to study that pic…then I saw the feet! lol. LOL!! My Brooke likes to cover her face too… So funny! Nope, if they can't see you, you can't see them. At least that's what my three year old thinks. Hilarious! I think that would drive my little one nuts, but it looks cozy and comfy to me! Hahaha! Cute! I used to do that.. not until the days got too hot. My kids are always playing this too with their blankets and sorts. HMMM. Wonder who is under that blanket? Very Cute. My 2 yr old likes to hide also but she doesn't do such a good job. Looks like someone doesn't want to get up. Silly, silly. If he was covered with a white blanket he could double as a ghost. 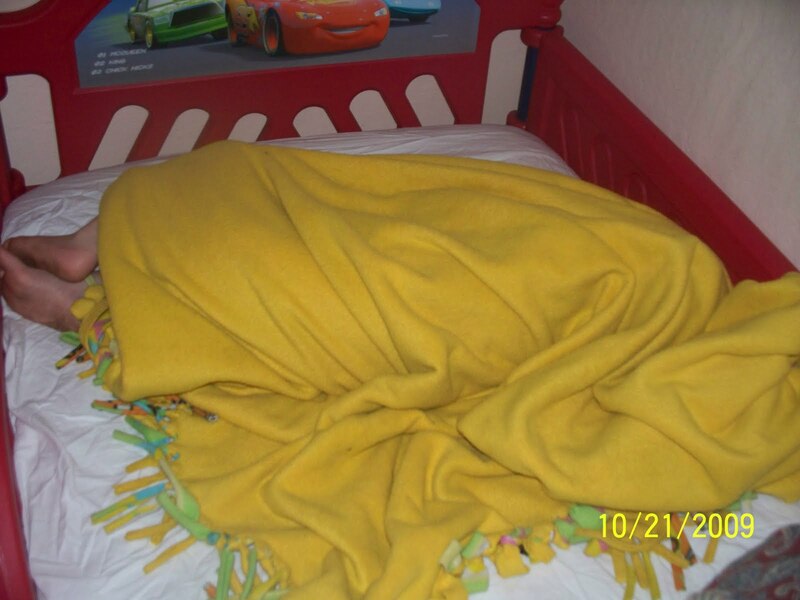 I cant see any legs under the blanket, i don't know where the kid has gone.